When a time for a big change comes and the seeking for a new place to start a new life in starts, people just sit and stare at the globe, wondering where to go. The globe doesn’t have any answers, but we do. How about Thailand? Yes, at first the name, and the place may sound overly exotic, and you might feel skeptical at the prospect of moving to a place where you have little understanding of the language, and even less knowledge about the country, but the fact is that the country is an extremely appealing place to be. A trip of a lifetime awaits. This question seems hard, but once you start looking, you will see that you have several options, and you will find appeal for every one of them. Choose Chiang Mai for a tranquil way of life and warm climate, with a history of Buddhist temples that dates back to 700 years, and an amazing mountainside setting which gives you a unique feel. Choose Koh Samiu for a beach lifestyle of you are not a fan of the mountains; it offers a strikingly affordable lifestyle unlike most beaches in the world, and it is hardly anymore different than the life you would get in Hawaii, for instance. Choose Hua Hun if you want a quiet village setting with beautiful beaches, and a great night market for all your needs; it is mostly a resort, but it does offer excellent and affordable housing for the ones who decide to stay. And, ultimately, choose Bangkok. You cannot go wrong with Thailand’s capital. It is the largest city in Southeastern Asia, it has high economy growth, and it is important for world culture and politics. It is a city full of friendly citizens, and full of energy, life, and entertainment possibilities. There is a big UK expat community, so depending on where you choose to live, you might now even feel the social changes. And don’t think that you will go broke once you go there. 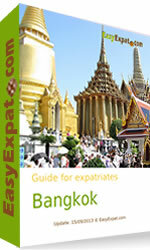 Bangkok has a very expat-friendly job market that offers opportunities for everybody. The most common profession for all British people is usually becoming an English teacher – it is widely needed, and it pays well. Still, there will be a noticeable difference in expatriate lifestyles – most expats in Bangkok are there because they were sent to another work branch by their company, and UK wages are much, much bigger than the T hai ones. This hardly matters, of course, as Bangkok still has an affordable lifestyle for any wage range. Rents are low, public transport is cheap, markets are great. There really is no reason not to try the country as a place to live in. So if you still want that life change, start learning the language and go to Thailand to start your new and exotic life.